Last year when the National Park Service raised the price of the senior citizen lifetime pass from $10 to $80 we’re assuming there must have been a loud outcry. Jim DuFresne, the main contributor to MichiganTrailMaps.com, missed being able to purchase the “cheap” pass by a couple of weeks. Was he angry? Hardy. He writes in our latest Trail Talk blog that at $80 the new pass is still one of the best bargains around for any senior still hiking and exploring the wilds of Michigan and the country. As always our eshop is open 24/7 and is stocked with the best guidebooks to hiking Michigan, Sleeping Bear Dunes National Lakeshore, Porcupine Mountains Wilderness State Park and, of course, Isle Royale. I’m gradually becoming a senior citizen. “But I’m only 55,” I replied. That was the start. I looked at her in a moment of disbelief and then threw away the coupon and accepted the 20 percent discount. I saved an extra 80 cents on the $14 haircut. Guess I am a senior citizen. Since then I’ve accepted senior discounts offered at hardware stores, drugstores, movie theaters, museums, you name it. The one area that I refuse to participate in is early bird specials at restaurants. Dinner was not meant to be eaten at 4 p.m. But this year I qualified for the best discount offered to seniors in this country; a pass to national parks, lakeshores and monuments. 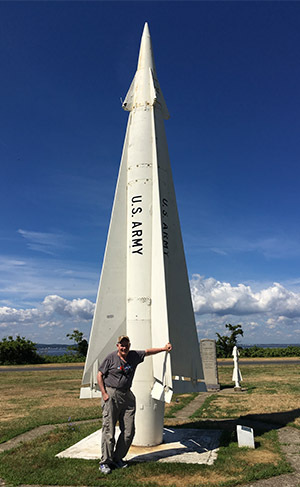 I arrived at Sandy Hook National Historic Landmark in New Jersey with my daughter, a New York City resident, for a day of beach walking and history lessons. This was my first national park unit since I turned 62 and when we pulled up to the fee booth and saw that I finally qualified, I pulled out the credit card. Jim DuFresne, now a card-carrying Senior Citizen, at Sandy Hook. I paid $80 for the plastic card with a picture of a Dall sheep on it and now I won’t have to pay to enter a national park for the rest of my life. It says so on the card right above Senior; “Lifetime.” I hope it’s a long one. My friend, a year older than me, says I was one year too late. He paid only $10 for the same pass. But last August the National Parks and Federal Recreational Lands Senior Pass was increased for the first time since 1994. Going from $10 to $80 is a lot and I’m sure there were more than a few seniors who complained about the steep increase. That’s what us seniors do, complain about rising prices. But not me. Not this time. 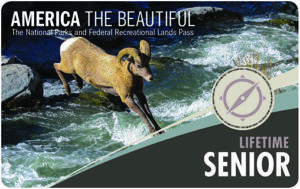 The senior pass provides access to more than 2,000 recreation sites managed by six federal agencies. The two that matter the most to me are the National Park Service and the U.S. Forest Service. Before I arrived at Sandy Hook I have purchased an annual pass to Sleeping Bear Dunes National Lakeshore almost every year along with a Forest Pass to the Manistee-Huron National Forest. They allow me to park at the trailheads, beaches, dayuse areas, boat launches. This year the two of them would set me back $70; with $40 for the national lakeshore and $30 for the national forest. If this was a summer I was scheduled to make a run to Isle Royale National Park, you could add another $60 to that bill. And when I’m ready to take another swing out west to visit those great national parks I’ll save $35 each for vehicle passes at places like Yellowstone, Grand Canyon and Rocky Mountain National Park. It was a no brainer, even for this coupon-clipping senior. Seniors – people age 65 and older – represent almost 15 percent of the total population in the United States and by 2060 will comprise of nearly one in four U.S. residents. It’s also well documented that they are living longer, staying healthier and enjoying a lifestyle that is far more active than ever before. Many have the physical ability, the time and the financial resources – we’re talking only $80 here for the rest of their lives – for such a fee. Why shouldn’t they pay? And who is going to subsidize them if they don’t; a young couple who have two toddlers, are worried about their mortgage, paying for their kids’ college and, of course, saving for retirement? The wide, sandy beach at Sandy Hook. But most of all I see the $80 as an investment in the crown jewels of our country; national parks, monuments and forests. The money raised from the sale of the senior passes goes to, not the government, but into an endowment managed by the National Park Foundation that will use it on projects and activities to improve national parks. Who knows, maybe Isle Royale will finally get a new boat to replace the aging Ranger III, which has been in service since the park opened in the 1940s. If the pass is purchased at one of the other five agencies, such as the U.S. Forest Service or U.S. Fish & Wildlife Service, more than 80 percent of the funds will be retained by the site that sold it and spent on visitor-related projects and programs. In return for supporting the parks, I get free entry. That includes a unit like Sandy Hook. 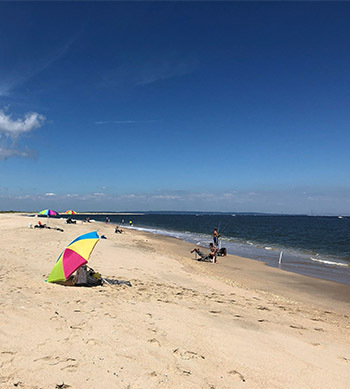 A barrier beach at the northern end of the New Jersey shore, Sandy Hook’s location at the entrance of the New York Harbor ensured it a long military history dating back to the American Revolution. The park includes gun batteries, missile radar sites, restored officer’s homes in Fort Hancock and the country’s oldest surviving lighthouse. But there was also a natural side to Sandy Hook. Thanks to the Federal government’s purchase of the entire peninsula in 1814, Sandy Hook has been spared the commercial development that dominates much of the New Jersey coast. The park offers excellent birding, including the endangered piping plover, hiking trails, opportunities for surf fishing, you can even camp there to a view of the Manhattan skyline. It was an incredibly interesting afternoon and in my mind it was a bargain. Even if I wasn’t a card-carrying senior citizen. For more information on Sandy Hook go to: www.nps.gov/gate or call the Sandy Hook Visitor Center at (732) 872-5970.